The Redged RMA-432 4-Section Aluminum Monopod is a tall, strong monopod for shooting situations that require a lower-profile or lighter camera support than a tripod would afford. The RMA-432 reaches a generous maximum height of 66.9", making it a comfortable eye-level support for almost all users – and with a load capacity of 33.1 lb, it's a robust support for almost any camera configuration. The RMA-432 features twist-lock leg stages and a foam grip on the upper section for secure, comfortable operation even in extreme temperatures. A hand strap serves as a line of defense against equipment drops. 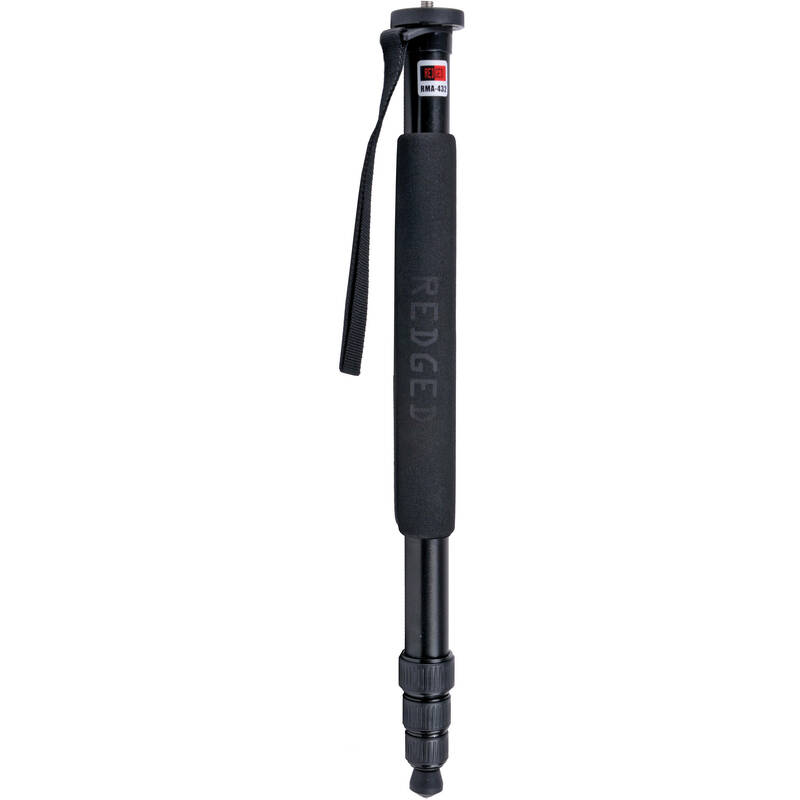 The monopod has a reversible 1/4"-20 & 3/8"-16 screw, so you can mount any head or camera directly. Box Dimensions (LxWxH) 21.7 x 2.9 x 3.1"
RMA-432 4-Section Aluminum Monopod is rated 5.0 out of 5 by 1. Rated 5 out of 5 by spockadee from Solid Monopod! I recently discovered the Redged company and was impressed by the info on their website. I needed a monopod to steady video shots of my Canon 60D. I do a lot of outdoor shooting, sometimes in extreme weather conditions. I am very happy with the performance of this monopod. It deploys quickly and is very solid. It comes with a bag that has a handle on it, which is nice. I attached that to my belt and took it on a bike ride on a coastal island recently. Works like a charm!